We have finally finished knitting for the new baby across the street. The week he was born the sky filled with storks-- over 100 of them. We counted!! I'm not pleased with how the sweater turned out. It's like one of those magic washcloths that grow exponentially when wet. Seriously. It started out life much, much smaller... it was only when I blocked it that things went terribly wrong. Next time I won't be blocking anything on my birthday. I'm sure that had something to do with it. It was another good exercise in showing the children how to accept defeat. On your birthday, no less. But it's still cute. I gifted it anyway, and despite its faults, the mom adored it. Whew! It's so hard when gifting goes awry. 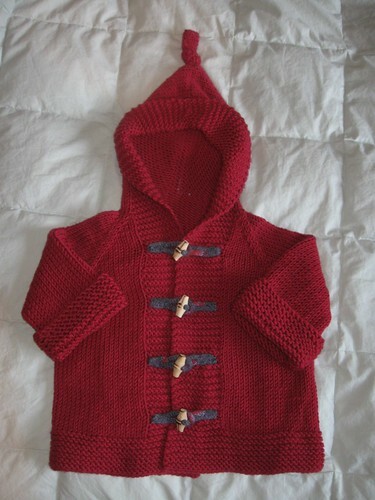 The pattern is the very cute Duck Soup by Anny Purls. I will be making it again, larger, with different yarn. The kids are all insisting that they need one in their sizes, too. Funny kids. I think that top knot has them enchanted. 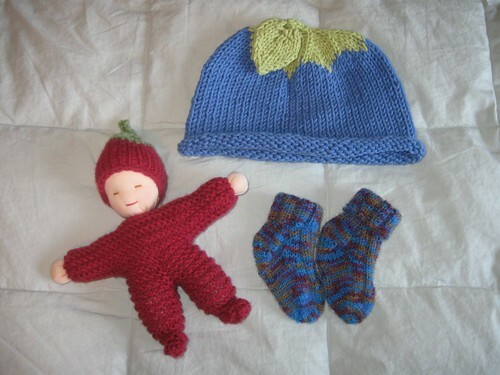 I also made the baby a blue berry hat, just because, with a leaf embellishment. Though I have since been told it was a cultural faux pas to give a baby hat without straps. I wonder is this really true? In America it's pretty standard to have hats that don't tie. Sunburst knit the baby a pair of socks. She did a nice job with them, and she was very excited to see him wearing them yesterday! The pattern is called Leftovers Baby Socks (or as the pdf link reads: Baby Socks - Turned Heel). This was Sunburst's second time making baby socks-- though it has been a long time. She found this pattern easy to follow on her own, and she has since made another pair for another baby. I have to say that they are great newborn size, but for bigger babies they would run a bit small. And Moonshine helped me knit the doll for the baby's big sister. This little girl has been feeling a bit displaced by her baby brother, and she was very pleased to be receiving a gift, too. It's just a tiny doll, but she pushes it around in her doll stroller just the same. And she chews on the hat. She's only two. I find it fascinating that the texture of wool is something she finds comforting enough to mouth. The girls are so pleased to see their gifts being used and loved... it's good incentive for them, since there are still two more babies to knit for. I think it must have something to do with all those storks! I think all the projects look fantastic. Love the colour of the bootees. I have been knitting for about 30 years now and only heard of blocking a couple of years ago. I still don't do it. I don't like the way the iron flattens the wool. AND I guess Im too lazy! hehe! Yes, all of the projects look fantastic. Lucky babe and sister! Sara, I don't see anything "wrong" with the sweater. It's so cute, lovely red. We want to knit socks this year -- I'm almost scared to start. I've never done this in my whole life. Karisma, I've never blocked with an iron. I always do wet-blocking. What I should be doing is wet-blocking my gauge swatches, but I am much too impatient for that. I can now see how it would pay off, so it's something I need to work on. Eva, good luck with the socks! I promise they are not hard. Getting into sock knitting takes more faith than it does skill. I know you'll do just fine!! Your kids are as talented as you are! I also don't see anything wrong with the sweater...bulky is very cute. :) Sunburst knits better socks than I do!